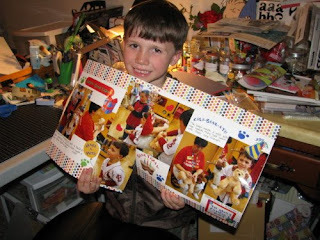 I am often asked when I find the time to scrapbook. Well, the answer is whenever I get a chance, but that's usually after everyone else in the house is in bed. 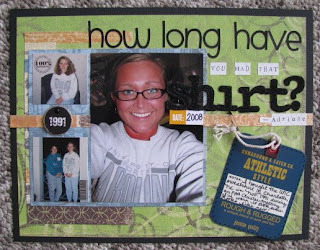 This past week I had many late nights in my scrapbook area. One of my favorite recent layouts is for Kevin's album. It tells the story about his Rosary, Pappa's Rosary. I made this layout with some pictures from last fall. I was happy to answer the doorbell to find a love note on the sidewalk and two happy boys with their artwork. I used papers from Paper Trunk that were in my Personal Scrapper May add-on. This next layout just makes me smile. Kevin loves to help in the kitchen and I captured him helping make Sunday morning breakfast one weekend. He loves to flip the pancakes! Oh...and don't you love the apron?? I grabbed that on clearance at Old Navy after Halloween. It's my favorite! 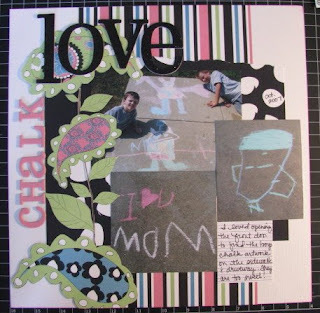 For the layout, I used my May Personal Scrapper kit for this (new Chatterbox papers). You can't tell in the picture, but the flowers are cut out of paper and the centers are raised up with pop dots. 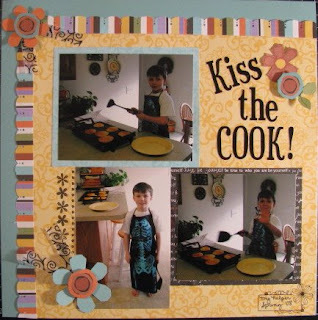 I used my new favorite tool - a Martha Stewart border punch - to make the scalloped edge on the striped paper. 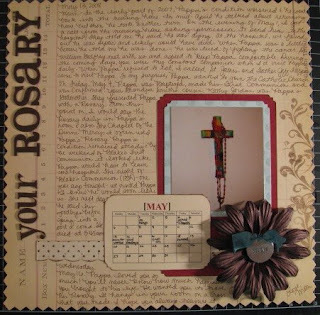 I made another layout with the May PS kit with pictures of my visit at my parents' house with my aunt Sandy and cousin Tiffany. 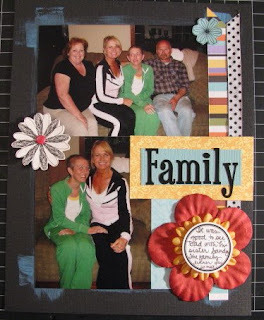 This next layout was inspired by a conversation I had with my sister, Adriane. One night over dinner she asked how long I'd had my UNC sweatshirt. Tada...a layout was born. I found pics from the weekend I purchased the shirt...in NC!...and mixed them with a current self-portrait. I used Crate Paper papers for this one. Finally, I sat up one night and used the mini album from the Personal Scrapper May add-on to make a little book all about me. It's 4.5" square. It makes me happy.